Sales can be considered as one tough aspect of a business, as the candidate needs the skill to sell any item. For ones who are applying for a sales interview job, it is important to remember that during the interview process, the interviewer may ask the candidate to sell an item to identify his skills. It is therefore important to know the exercise for the interview which would otherwise lead to nervousness and get locked up. In order to face this, it would be good to practice well ahead rather than standing dumb. Here are a few tips about how to sell a product in an interview. A sales profession is one in which if you are willing to work hard, then you can earn good amount of money. probably encounter a common question where the interviewer will be asking you to sell them a product. No matter how confident the candidate is, nervousness arouses up in the mind of the candidate when encountered with such a question and their body language show it up. By this, your employer will get an idea about you. The main purpose of asking this question is to check how well you can handle pressure. So the best tip to deal with such a question is not to get into a panic mode. You can take little time and frame your question in a proper way and then answer. Another important tip which you can follow and would work well is to practice these type of questions in advance. When you are about to attend a sales interview, you need to be well prepared to face any type of typical interview question. One such question would be how to sell an object in an interview. 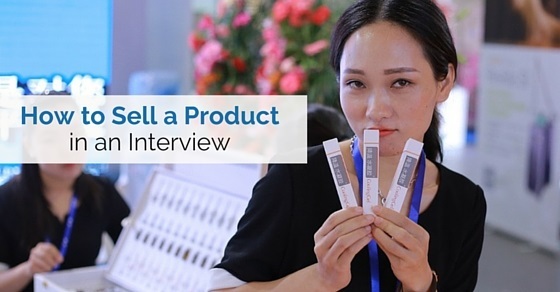 The interviewer could hand over a product to you, it can be pen, pencil or the stapler. When you provide the answer, the interviewer will assess your selling and interpersonal skills. As you have applied for a sales interview, so getting into such a question is obvious and moreover you should take it as a challenge to prove yourself in front of the interviewer. How to Sell an Object in an Interview? Finally, promote yourself by being confident, persuasive and engaging. The following mentioned are few sales interview tips on how to sell a product in an interview. The night before the interview make sure to run through exercises and examples to sell a product. The interviewer may ask to sell some product that is visible at time of an interview; it can be a pen, book, and more. When such preparations are made the candidate is not under pressure and can answer in a confident manner. Instead of being nervous the candidate can recall and answer the selling points. The main intention of selling is to see the capability of the candidate in selling the product as a pen. Selling is not just listing the features of the product, because that amateur sales, as.anyone can list the features of the product. For selling, the candidate should know the client needs and sell as per the client needs so that they are convinced to fetch the product. Do not concentrate on just one single item; make sure that you focus on a category of different items seen in an office environment. This is a good way of preparation as the interviewer can toss between items. In the same manner the candidate should also be familiar with the products the company sells as the interviewer may ask the candidate regarding that product too. Whatever product is to be sold, the candidate should know what’s in the product and the benefit in it. A true sales person would know how the product would benefit the customer and he would mention the same in the interview. This is the way of product selling, so that the customer would consider and take interest in the product. When a salesperson is told to perform in an interview, the candidate should relate with the customer. The salesperson should put himself in the shoes of the customer and relate him from that aspect. In an interview, it is mandatory to develop action for sales. This is the final phase of sales in action and so one should never overlook. As a sales person you need to give a reason for purchasing the product. Though it is an interview, the complete exercise should be done like real sales. The initial thing that your interviewer should know is your interest in sales so that he would recruit you. Show that you’re interested in sales and a right fit for a sales person position. In the same manner, with a good communication skill you can open up that you like the product and service and would be interested in selling a product or service. The candidate should make sure that he makes the sales an interactive approach while selling. He can ask the interviewer some questions or expect some answers while selling a product. By this way he is making the customer or client gain interest about the product. There may be concerns, questions that may pop up from the interviewer at times of sales. Counter opinions are one aspect which the sales person needs to focus at in an interview. Addressing such counter opinion without getting frustrated is one aspect to be followed. It is important to be cool and concentrate on the task assigned. The interviewer can develop such counters intentionally to see how the candidate handles it. During the interview session in the process of sales, make sure to answer any type of sales interview questions asked without hesitation. Be confident enough in the sales process and also answer any queries asked in a confident manner. All these aspects present that you’re a perfect fit for a sales position. In an interview when you’re performing your mock sales exercise, make sure to show enthusiasm and fun during sales in an interview. Do not be serious while selling or do it as a task to be completed. Involve yourself, show that you’re enthusiastic about selling and also open up your special style in selling. Also show that you’re self-motivated and love to sell. The interviewer looks for these aspects during the interview session. During sales some may be from remote situation where sales can be through a phone call where voice tone is mandatory or some may be presenting yourself as a product where body language, voice tone and smile is important. During a sales session always wear a smile on your face along with a perfect voice tone which pleases the interviewer. Voice is an important parameter which convinces and grabs the attention of an interviewer. While in the exercise session of the interview these tips should be followed. Every sales task has its own difficulties and disadvantages. A sales person can come across many categories of people; some may curse, shout and even more. So in an interview the interviewer can shout, frustrate or criticize you for the selling task. In such case the candidate should be able to handle the task. By this way the interviewer would like to know if you are fit to handle the situation. The answer for interview questions for sales must never show up that you’re very sensitive to a sales position but it should be honest. The interviewer would look into such aspects before he could recruit you. This can be one way to sell a product in an interview. While selling an item to the interviewer in the interview, keep in mind to talk about the warranty of the product. Apart from selling the product whether its pen or book, the post-sale benefits are to be mentioned to the interviewer. Apart from just listing the attributes, pick out aspects the buyers are looking for and sell it. Instead of just showing pens for sale, make it a point to highlight the aspects that make the product necessary in the buyers’ life. This is an important parameter the interviewer desires from the candidate. In an sales interview when you’re asked to sell there are few aspects expected by the interviewer for a salesperson role. The candidate needs to follow a professional way of selling products and possess the capability to build a rapport with the interviewer. The interviewer should be asked the right questions, the candidate should understand his needs and values and more. The candidate should show that he can adjust to varied people and approach. He should be able to listen in a careful manner and probe the appropriate questions. At times of rejection or disappointment, the candidate should be able to come across it. He should be able to persuade and influence the interviewer, he should be able to plan and execute and finally the candidate should be able to reach his target. These are a few aspects expected by an interviewer in the interview. There are a few tips to follow before attending a sales interview. The candidate needs to brush up regarding the industry. He should be able to sell a product as requested in the interview and also sell himself by showing his skills in that opportunity. His selling prowess should be depicted by the exercise they assign on the spot. He should also bring out that he can handle all sales job interview questions and all situations in a cool manner. By bearing these tips in mind he must sell a product in an interview. An interview performance is mandatory in order to obtain a sales job. The sales techniques to answer and sell a product in the interview are mentioned above. Ones who are preparing for an upcoming sales job interview can glimpse through these pointers and get prepared so. The article explains some sales strategy and selling skills, to sell a product in an interview session. You may have potential as a sales person but the day of the interview where you’re given a sudden task to follow is important to prove yourself. Facing an interview for sales with prior preparation is mandatory to excel and get recruited as a sales person. Previous articleWhat is a Skill Based Resume? Is it Good for you?